At FNSI last night, I managed to make a fabric craft box. I made a few of these a couple of years back and wanted to see if I still remembered how to make them... so I tested out my memory last night. Now that I do... I will make lots more from my stash. Gotta LoVe using scraps and stash for little projects like this. please CLicK on over to HeRe. How are your Christmas in July swap gifts going? Getting them done I'm sure. This is just a friendly reminder to keep you working on them. And more importantly... still EnJoYing the swap! Lovely work on the little box. What a great idea for gifts. Such a cute and versatile little box. I can see many uses for them. Lovely project . You are so productive. We made those sweet little fabric boxes at a retreat a few years ago. Love mine and yours! I ought to make a few more for other miscellaneous stuff! They're so handy! 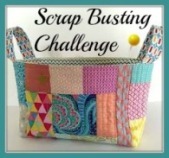 Fabulous way to use scraps out of your stash Cheryll. Very cute little fabric box - and handy too :-) Lovely wee blankets.